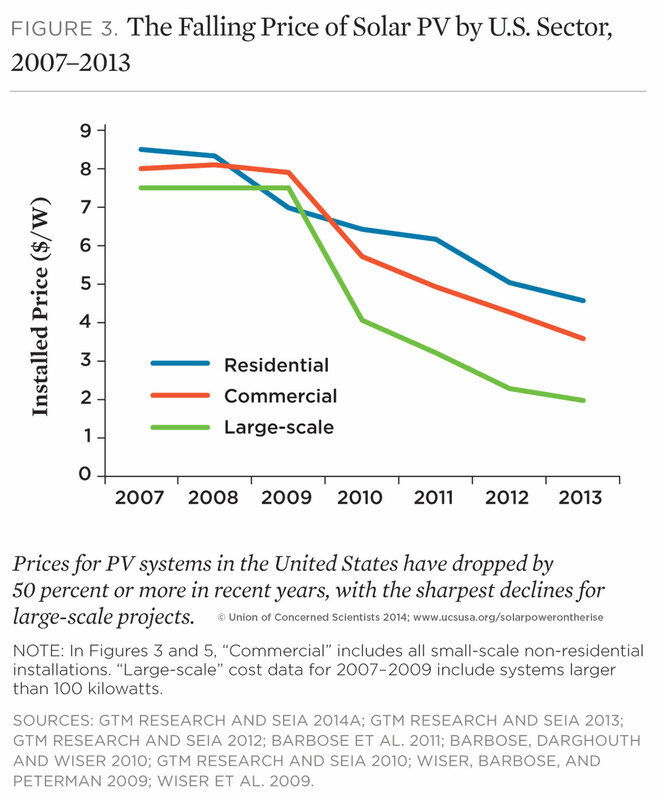 Tax credits, rebates, and other support in leading states can cut the total costs of a rooftop system to under $10,000, though many solar customers are paying little or nothing up front by utilizing solar leases or power purchase agreements, which provide electricity from the system over a long period at attractive fixed rates. In a sunny location such as Los Angeles or Phoenix, a five-kilowatt home rooftop PV system produces an average of 7,000 to 8,000 kilowatt-hours per year, roughly equivalent to the electricity use of a typical U.S. household. By early 2014, the United States had more than 480,000 solar systems installed, adding up to 13,400 megawatts (MW)— enough to power some 2.4 million typical U.S. households. The U.S. solar industry employed more than 140,000 people in 2013, a 53 percent increase over 2010, and is investing almost $15 billion in the U.S. economy annually. 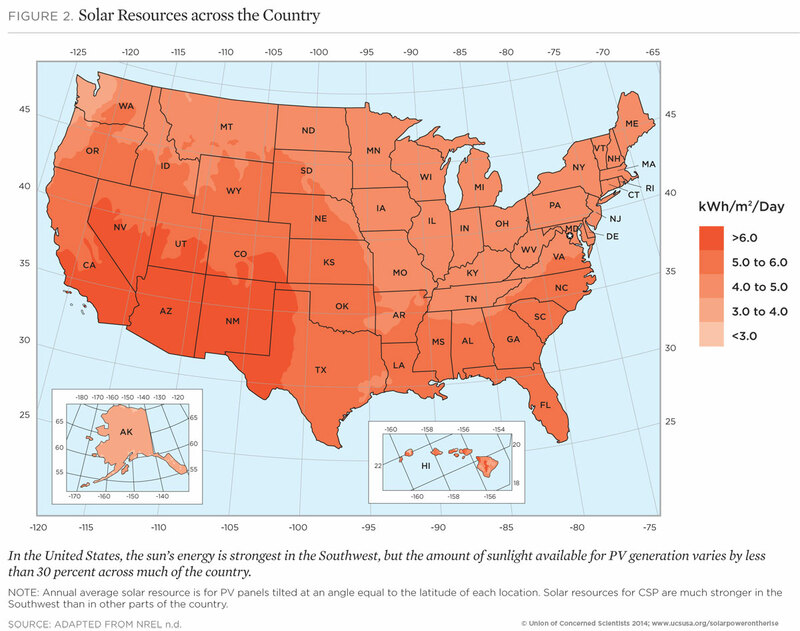 There are currently more than 6,000 solar companies in the U.S., spread across all 50 states. Renewable electricity standards. States should maintain and strengthen their key policies for driving renewable energy investments, including solar. Solar tax credit. The federal investment tax credit that has been so important for solar’s rise is set to decline at the end of 2016 from 30 percent to 10 percent; Congress will need to take action to sustain that support. Federal power plant carbon standards. States should ensure that solar plays a strong role in their plans to reduce emissions to comply with the Environmental Protection Agency’s new carbon standards. 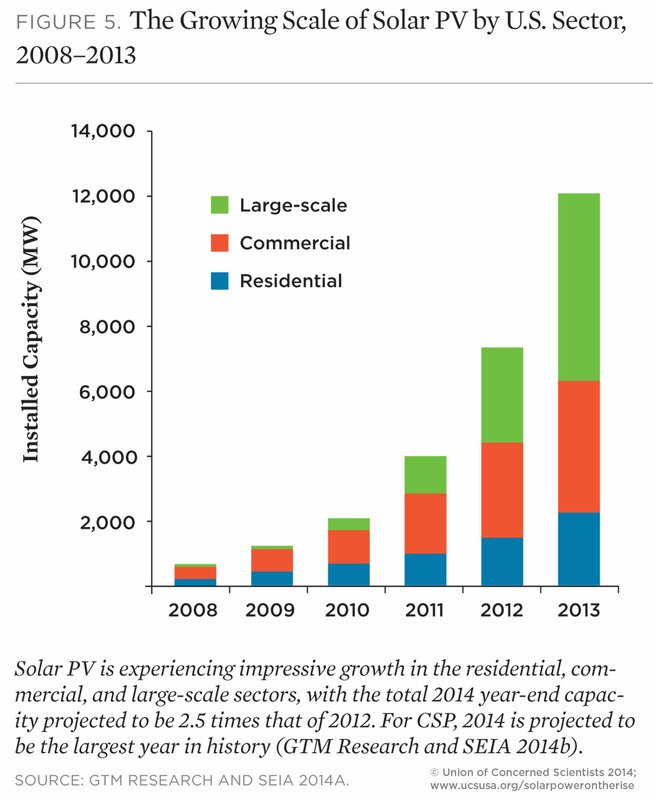 The full value of solar. Assessing the full range of benefits and costs of solar, particularly rooftop solar, will help policy makers decide the most appropriate way to assist more people in adopting solar. Storage. Lower costs and the greater availability of energy storage technologies will help provide electricity more consistently and at times of peak demand. New utility business models. Utilities should modify their business models to accommodate high levels of rooftop solar and encourage continued solar development, from rooftops to large-scale projects. Research and development. Solar’s prospects will be enhanced by continued progress in reducing costs—through greater economies of scale, increasing cell and module efficiencies, improved inverters and mounting systems, better heat transfer, and streamlined transactions.